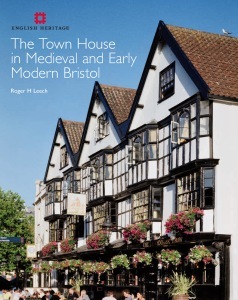 This study, covering the period c.1000 to c.1800 AD, is of the medieval and early modern houses of Bristol, England’s second city in the later middle ages and again in the 18th century. Based partly on the survey of surviving early buildings, the study also makes extensive use of documentary evidence and records of houses now demolished to analyse how town houses reveal the social structure and aspirations of Bristol’s citizens in this period. The development of the town and city in the medieval and the early modern period is examined, then aspects of life on the urban tenement plot. The principal house types of the medieval period are fully explored, showing the aspirations and separate identity of the urban elite in the largest of such houses. Changes to existing houses and the emergence of socially distinct neighbourhoods all serve to underline differences in life style and status. Similar houses in North America and the West Indies underline Bristol’s pre-eminent position as a commercial city on the Atlantic rim in the 17th and 18th centuries. This book demonstrates the possibilities for using documentary and physical evidence to reconstruct the fabric of a city and the social character of its different parts. Particularly important is the development of a new way of looking at medieval and early modern urban housing, focusing specifically on the relationships between different building types and changes in building forms, both of which reveal the complex character of an evolving commercial city. This book is clearly the result of a labour of love and offers as much in the way of social as architectural history, revealing the character of Bristol as a commercial city of great character and interest. ... this richly textured and thoughtful study, created through a long and profound study of words, images, and structures, will provoke thought and emulation elsewhere, and take a centre place amongst the new generation of town studies, meanwhile introducing us to a memorable parade of superb streets, buildings, and interiors from all periods. ... a learned, painstaking, thoroughly researched and handsomely illustrated reconstruction of an urban fabric now largely lost or overlain. ... a triumph of dedicated scholarship and an inspiration to other urban historians. ... this is a magnificent achievement which will help to shape future approaches to the study of urban history. ... It can be strongly recommended to everyone with an interest in urban housing. Professor Leech has written what must remain for decades the definitive account. ... for anyone with an interest in the topic it is worth every penny for the instruction and pleasure it will afford. More, it is indispensable.